An important part of our prevention program is your regular cleaning. Even with excellent oral hygiene, there are parts of your teeth which may be hard to reach, and a build up of plaque can lead to hard deposits which can no longer be removed by brushing, leading to inflammation or even infection. How do you know if such areas exist ? Well, if you have a trace of bleeding when you floss or brush, you have inflamed gums. A professional cleaning, using our special polishing spray helps to reinforce your home cleaning. If you are one of the 30% of the population suffering from periodontitis (gum disease) we might want to see you every 3 months. Periodontitis is most often recognised by receding gums; swollen or bleeding gums can also be a sign. Whether you use an electric or manual tooth brush, make sure that the head is not too big, aim for a small one. Brush twice a day for two minutes. All teeth have 5 surfaces: the front, back, inside, outside and the biting surface. Try to clean all of these but remember that the most important place to clean is where the gum meets the tooth. Cleaning the front and back of a tooth can be done with floss or inter-dental brushes. Both must be used gently and regularly. Try to brush your teeth systematically, starting on one side at the top or bottom, cleaning the outside of every tooth, then the inside, repeat on the opposite arch, then brush the biting surface. Interdental hygiene, or cleaning between your teeth is one of the most important aspects of good oral hygiene. Everybody cleans the large surfaces of their teeth because they are easy to reach, cleaning between the teeth can be harder. It is important to clean this area as food deposits will build up here resulting in plaque which carries many bacteria. The toxins produced from these bacteria irritate the gum and bone and if not removed for long periods of time will result in gingivitis and later periodontal disease. 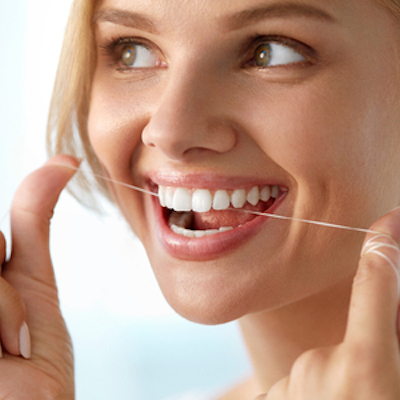 Dental floss is best for people with very tight spaces between their teeth. You wrap each end of the floss around one finger on each hand and gently see saw the floss between the teeth with light downward pressure to avoid damaging the gum If you find flossing tricky you might want to try flossers, where the floss is already mounted onto the frame. They are used in the same way as regular dental floss. Super floss is specially designed for people with bridges or orthodontic braces. It is a very long piece of floss with a hardened section at one end. This section can be pushed through the space in the teeth, then pulled through introducing the softer part which is moved under the parts of the bridge where the teeth are absent. It is used in a similar way with orthodontic braces, threaded between the tooth and the wire. These are very small brushes which you gently push between the teeth close to the gum. They are best for people with larger spaces between their teeth. They are great for removing plaque. They come in all different sizes to accommodate the different size spaces between the teeth.